The Chicago Auto Show has become the nations largest car show, covering over 1.2 million square feet in space. Barcos display solutions were there to add dazzle to over 75% of the booths. This year, Barcos LED solutions were creatively set into the Mercedes Benz, Land Rover, Hummer, Dodge, Chevrolet, Acura, Lexus, Toyota, Ford booths and many others. Creative set-ups included, large curved LED displays using Barcos ultra-high resolution ILite 3 (Toyota booth, by Barco rental partner XL Video), and (Land Rover booth, by Barco rental partner, Creative Technology) added a shower of rain in front of a 5 x 9 ILite 6XP LED wall. 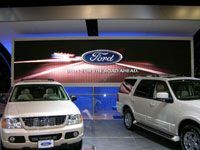 Over 25 automotive manufacturers chose its display solutions for the 2005 Chicago Auto Show. The Barco LED display systems are represented at the Chicago Auto Show through Barcos rental partners including CT (Creative Technology), BlueWater, IMAG, and XL Video. Over the past five years, Barco displays have been a highlight on many of the worlds leading auto manufacturers booths. From Porsche, Audi, Saab and Pirelli to Corvette, Lexus and Volkswagen, all have used Barcos state-of-the-art displays at one of the worlds leading auto shows. From Paris to Tokyo, Frankfurt to Chicago, Barcos revolutionary ILite 6XP or its tiny MiPIX LED blocks have helped create show-stopping booths in an environment where glamour and glitz is the order of the day. Barco announced the debut of its newest indoor/outdoor SMD LED display, the OLite 510, live from the red carpet of 77th Annual Academy Awards pre-show held at the Kodak Theatre, February 27th. Creative Technology, an international audio visual staging solutions provider and long time Barco rental partner, orchestrated the installation of the 42 tile OLite 510 display. The 13.5 x 20 screen, housed at opening to the Kodak complex, treated viewers to larger than life images of attendee arrivals, custom graphics and clip packages. Inside the Kodak, Creative Technology placed Barcos ILite 6XP LED in the flooring, stage right, as an integral part of the set element. 335 tiles were used to create a dramatic 20 x 40 oval image displaying graphics and clip packages throughout the broadcast. This is the fourth consecutive year that CT has provided equipment and technical services for the Oscar event but the first year that Barco tiles have been utilized both on the red carpet as well as being incorporated within the Academy Awards set design. The OLite 510 combines the benefits of indoor and outdoor LED technologies in one reliable, robust LED tile built specifically for the Rental and Staging market. With its 5000 Nit light output, 15-bit processing, 1P65 rating and full TUV approval, the OLite 510 brings you an ultra bright indoor/outdoor display with all the benefits of the SMD LED technology, such as wide view angles and short viewing distances, combined with the rugged reliability you have come to expect of Barcos outdoor LED displays.